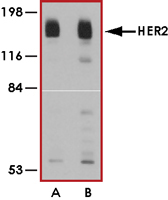 Sample Data :Western blot analysis of HER2 in rat liver tissue lysate with HER2 antibody at (A) 1 and (B) 2 ug/ml. 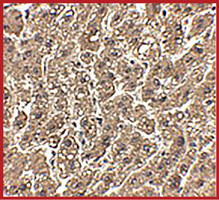 Sample Data :Immunohistochemistry of HER2 in human liver tissue with HER2 antibody at 2.5 ug/ml. Scientific Background :HER2 gene encodes a cell-surface glycoprotein tyrosine kinase receptor with extensive homology to the epidermal growth factor receptor. HER2 is an oncogene and overexpression of unaltered HER2 coding sequences in NIH 3T3 cells results in cellular transformation and tumorigenesis (1). HER2 is amplified in about 30% of primary human breast malignancies and overexpression of HER2 is associated with the most aggressive tumors that show uncontrolled proliferation, resistance to apoptosis and increased motility (2). 1. Hudziak, R M. et al: Increased expression of the putative growth factor receptor p185HER2 causes transformation and tumorigenesis of NIH 3T3 cells. Proc Natl Acad Sci U S A. 1987 Oct; 84(20):7159-63. 2. Badache, A. et al: The ErbB2 Signaling Network as a Target for Breast Cancer Therapy. J Mammary Gland Biol Neoplasia. 2006 Jan; 11(1):13-25.